DENVER, CO. — John Elway and Broncos coach Gary Kubiak were the keynote speakers on May 12, 2015 at the John Lynch’s 17th Annual Salute the Stars luncheon at Sports Authority Field at Mile High. The event is designed to recognize and reward student-athletes for their efforts in the classroom, in sport and in their communities. Mayor Michael B. Hancock, John Elway and new Broncos Head Coach Gary Kubiak assisted John and his wife Linda in saluting outstanding youth from the Denver area. John Lynch and his wife Linda awarded $84,000 worth of scholarships to eight high school scholar-athletes and two teacher-coaches. The big prizes were the $15,000 Legacy scholarships awarded to Kyla Foster, Zachery Peterson, Kaylyn Radtke and Jackson McCabe. In addition to the 700 guests in attendance on the field, the Foundation invited local schools to attend the event in the stands. More than 600 students from Denver Public Schools, Cherry Creek Schools and other school districts enjoyed the festivities and were treated to lunch provided by Papa Johns, Frito Lay and Coca-Cola. “What John and Linda do is tremendous. To be able to provide the scholarships that they provide long after John’s career ended, I think is really a tribute to him and the type of man that he is. We’re glad to be a part of it. I was glad to be a part of it. It’s neat to be here,” said John Elway, Executive V.P of Football Operations/General Manager. 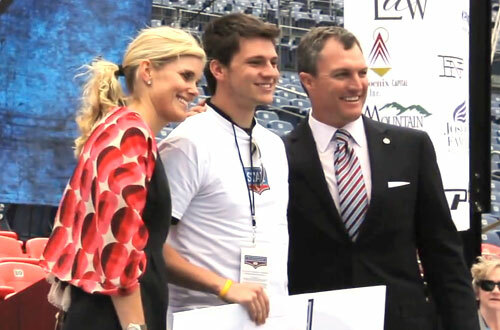 Watch the 2013 John Lynch Foundation Salute the Stars ceremony. The crowd of 1,300 heard from Broncos legend John Elway and new Broncos head coach, Gary Kubiak who engaged in a round table discussion and question and answer session covering topics such as leadership, adversity, perseverance, and of course, Denver Broncos football. Two lucky students were selected for a once in a lifetime opportunity to catch a pass from Elway and Kubiak, both former quarterbacks. 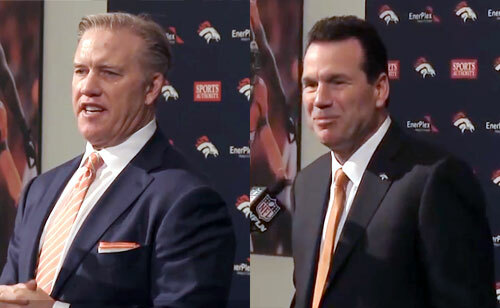 Watch coach Gary Kubiak and John Elway speak about the future of the team and Peyton Manning. John Elway and the Denver Broncos won their first Super Bowl title by defeating the Green Bay Packers 31–24 in Super Bowl XXXII. In the following season, Elway and the Broncos repeated as champions in Super Bowl XXXIII by defeating the Atlanta Falcons 34–19. Elway was voted MVP of that Super Bowl, which would prove to be the last game of his career. In 2004, he was inducted into the Pro Football Hall of Fame. Elway is currently Executive Vice President of Football Operations for the Denver Broncos and was instrumental in procuring Peyton Manning. Gary Kubiak became the new head coach of the Denver Broncos in Jan 2015. He previously served as head coach for the NFL’s Houston Texans from 2006 to 2013. Kubiak played as a quarterback for the Broncos from 1983 to 1991. He has participated in six Super Bowls, losing three as a player with the Broncos and winning three as an assistant coach with the Broncos and the San Francisco 49ers. John Lynch was a 9-time Pro Bowl safety who played 15 years in the NFL for the Tampa Bay Buccaneers and Denver Broncos. He was a key member of the Bucs Super Bowl XXXVII team. John and Linda Lynch formed the John Lynch Foundation in August 2000 to provide encouragement and positive alternatives for young people. In a time when violence and irresponsibility seem to be glorified, the Lynches are determined to reach students and instill in them the drive to become effective community leaders. Sports Speakers 360 is a booking agent for pro athletes. If you would like to book John Elway, Gary Kubiak or John Lynch for an appearance or endorsement, contact our booking agent for fees at 1.855.303.5450.